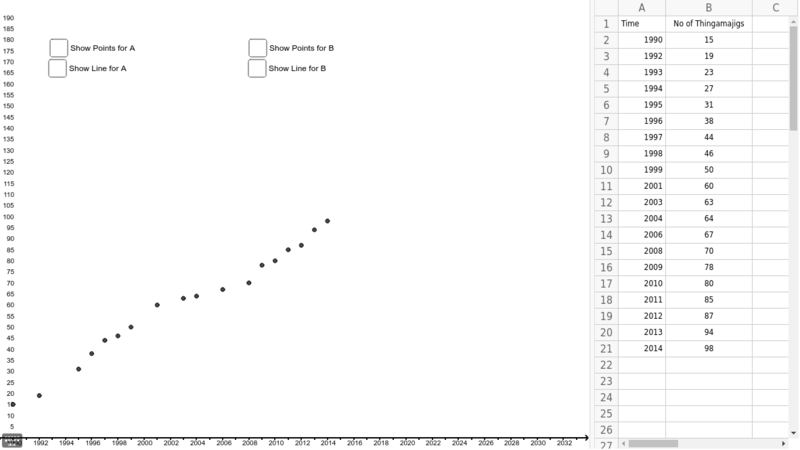 Best Fit Line Activity 1) Find a linear equation that fits the data for the number of Thingamajigs since 1990. 2) Click Show Points for A. 3) Move the two blue points so it will form a line that goes through (or is close to) most of the points. 4) Click Show Line for A. 5) Adjust your points so you get the best possible fit you can. 6) Find the equation. 1) What is the slope for your equation? Interpret it in context of problem. 2) What is the y-intercept for your equation? Interpret it in context of problem. Does it have meaning in this context?